A blog about our efforts to help indigenous youth of the Colombian Amazon to develop sustainable business. 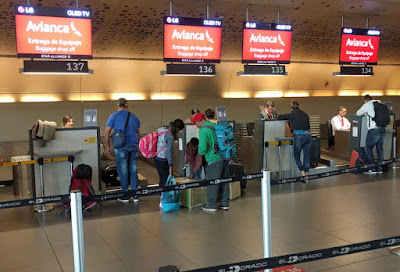 A trip to Bogota with two of the students (and one parent) from the scholarship program. Thank you to everyone who made this trip possible. 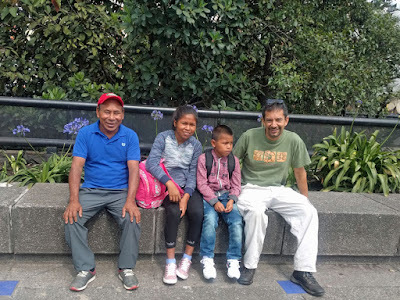 Jhon Carlos, Stefanie, and her father visited the capital city of Colombia, Bogota. While there, we went to the museum Maloka and other spots of interest. 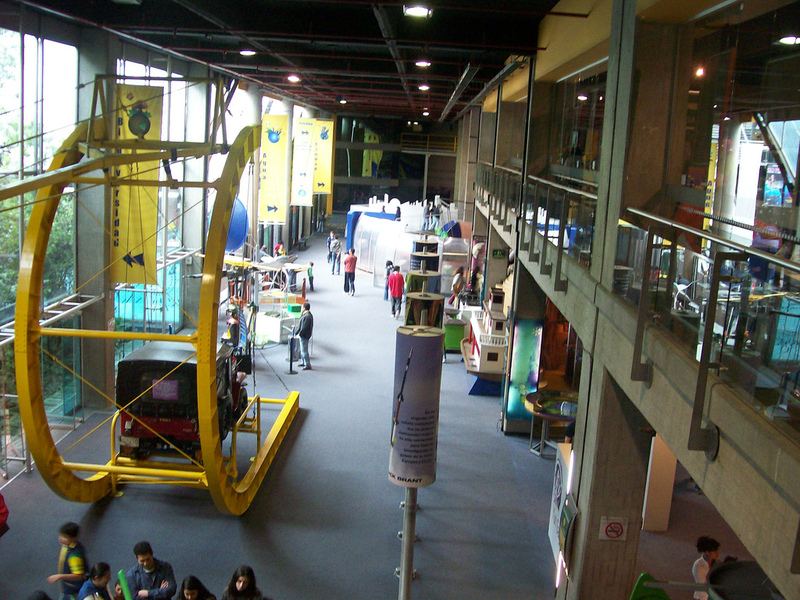 Maloka is one of the best science and technology museums in the country! 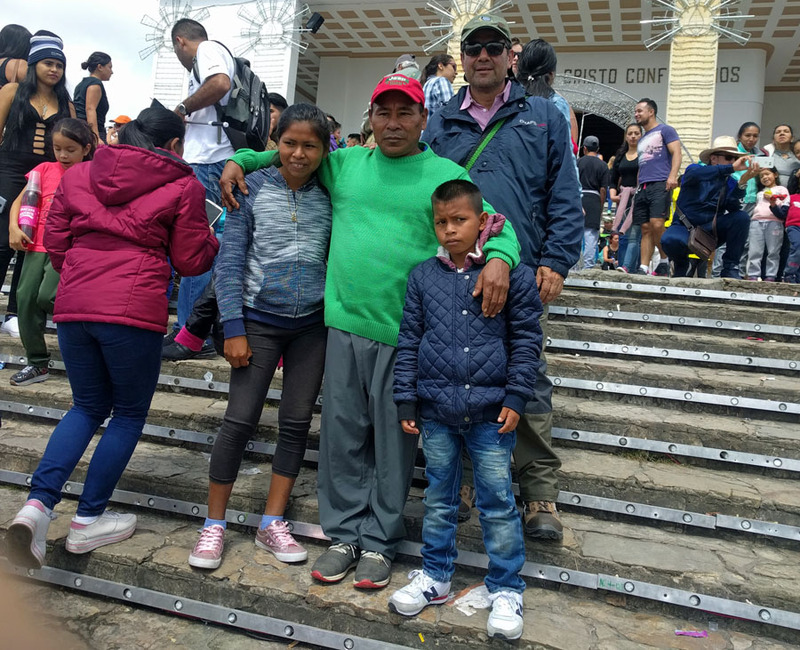 We wanted Jhon and Stefanie to experience the city and what the world has to offer and to be able to see the possibilities of life beyond their village. We wanted them to have more reasons to study and to excel in school. Our trip started Friday morning. Gustavo and the kids left at 4 in the morning. 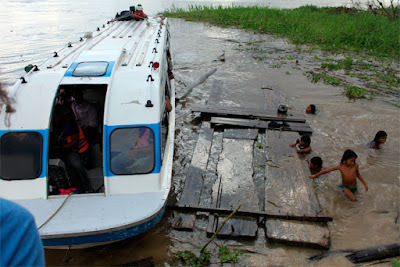 They caught a small boat to the jungle city of Leticia. This was less expensive than a speed boat, and it allowed them to go to Leticia earlier to buy things. The plan was for me to take the speed boat and to meet them at 9 am at the port of Leticia. However, things do not always work as planned in the Amazon! 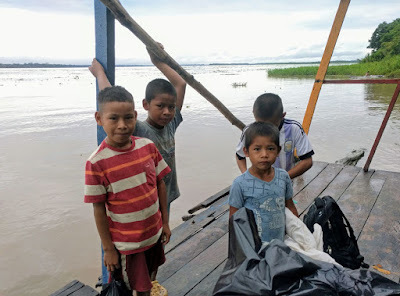 Gustavo's sons and nephews waiting with me for the boat. Unfortunately, the speedboats at 8 am AND 10 am were all booked. No room for me! I had to wait for the 2 pm boat downriver. I called and made a reserving to guarantee a spot on board. By 3 pm I arrived at the docks of Leticia. The "barco rapido". They take about an hour to go from La Libertad to Leticia. There are three different boat companies which operate on the river. They are known as the "red", "green", and "blue" lines. This is based on the color of the boats. Each company runs their boats on a rotating, three-day schedule. Today the blue line picked me up. 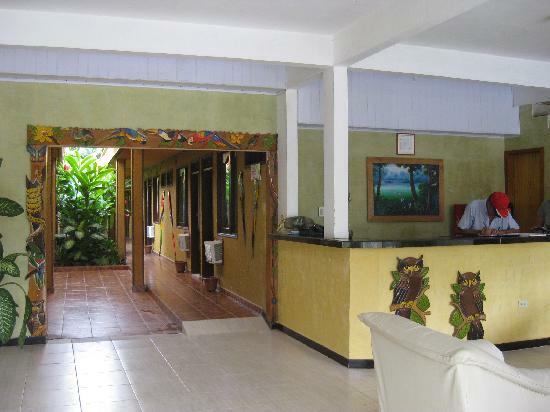 Don Felino, in the red cap, at the front desk of the hotel. Once in Leticia, I connected with Gustavo and the kids. We got something to eat and then checked into my favorite hotel in Leticia, Hotel Fernando Real. Stop by here for the best chicken in the city! After running some errands, we met with Freddy from Funmiroca, our partner organization in Leticia. We had dinner at Cali Pollos at the corner of the main street by our hotel. 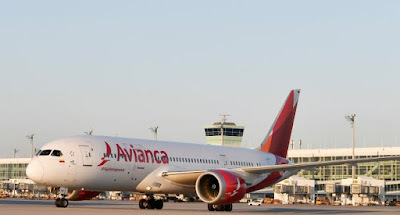 We flew with Avianca airlines. 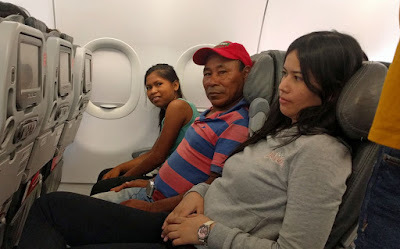 This was the first time any of the kids or Gustavo had ever been in a plane. 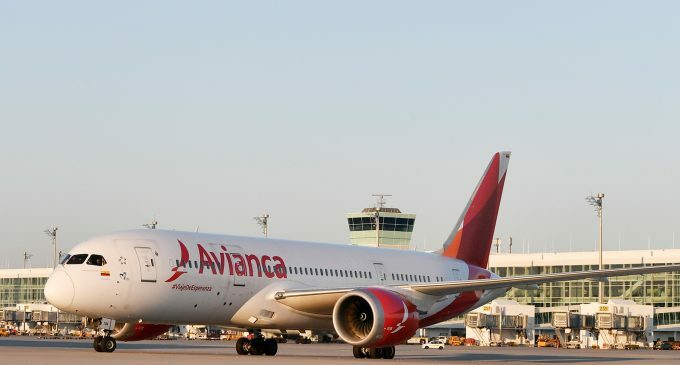 While they looked a little worried when the plane was taking off, they soon forgot their fears and got excited when looking out the windows at 10,000 feet! Stefanie and Gustavo in their seats before takeoff. The ride was two hours long. They were impressed that we each had a video screen to play games and to watch movies. The free beverage and snack service was also a welcomed surprise. The airport was the largest building they had ever been in. They constantly stopped to look around at different things. 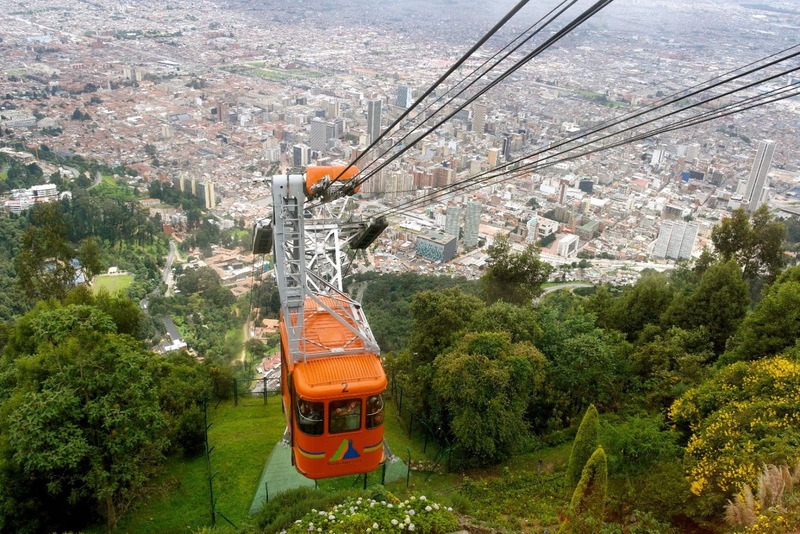 In Bogota, they got the first ever experience of a cold climate. 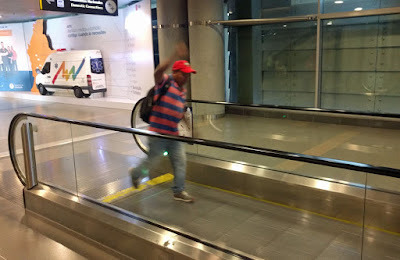 We were met at the doors leaving the airport by friends of ours who live in the city. Thankfully, they met us with some warm clothing. 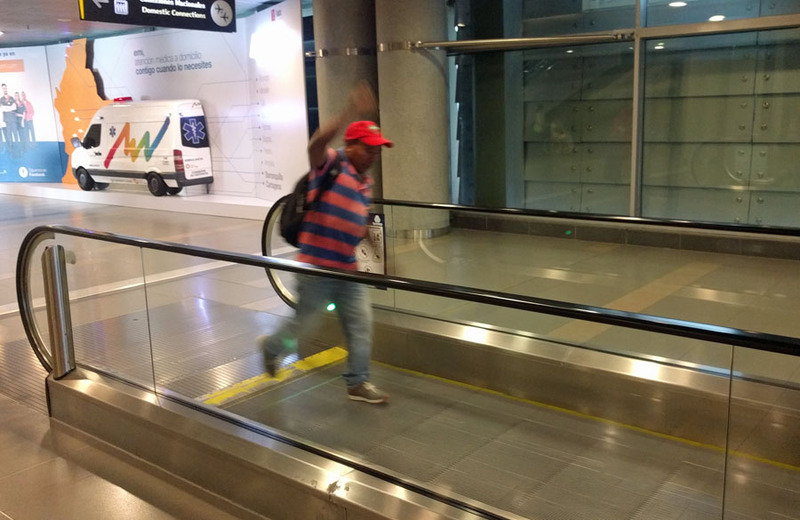 Gustavo rides a moving sidewalk for the first time. He jumped on it at first and almost fell! That day we went to the north of the city to stay at my apartment in the barrio of Suba. After fighting with a bit of traffic, we arrived just before sundown. 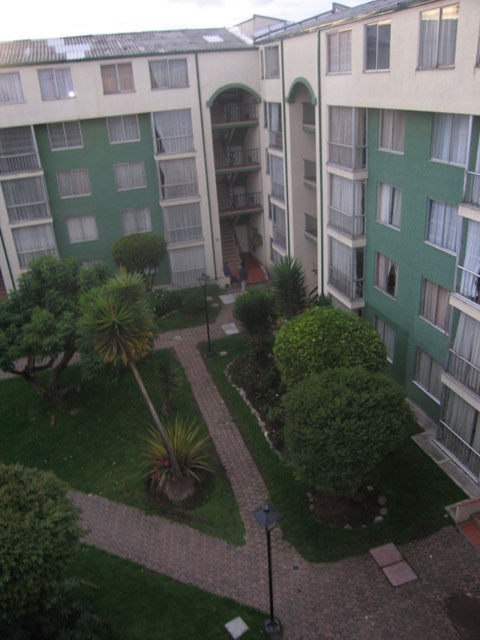 The view outside of my window in La Pradera de Suba. After preparing one of my favorite dinners, hamburgers, we settled down early to be rested for tomorrow's trip to the museum. 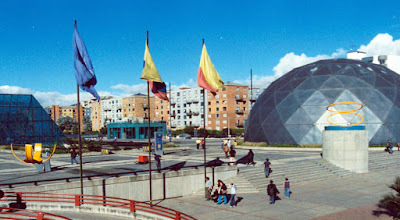 The outside of our main destination, the museum Maloka. Maloka is the largest science and technology museum in Colombia. 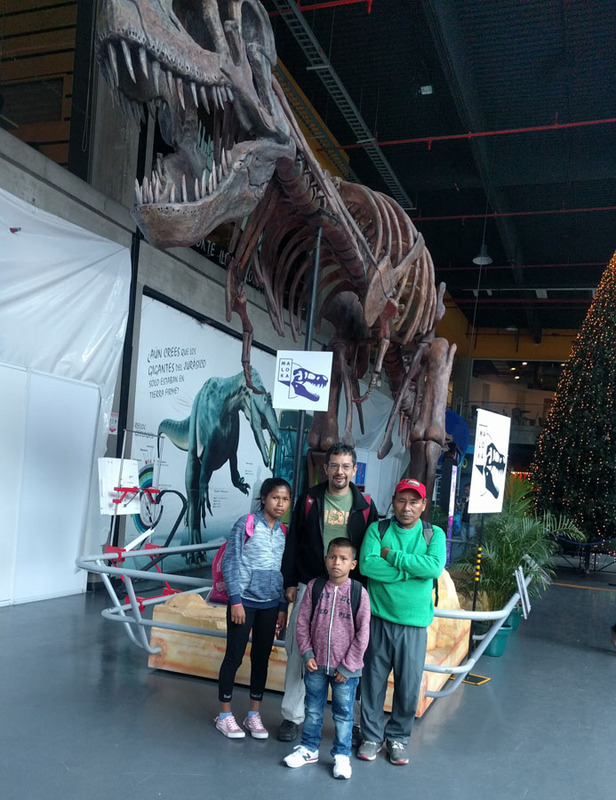 They have many interactive activities which help to explain and teach science concepts and principles. Each area also has museum guides to help explain what is going on and to run special demonstrations. 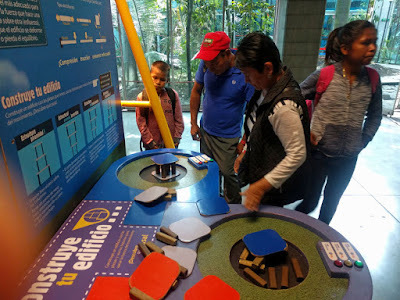 An interactive exhibit which explained how the energy waves from an earthquake destroy buildings. An exhibit which showed how the principles of leverage work. A 60 ponund child can lift a jeep! Stefanie hooked up to a Van de Graff generator. It was a shocking experience! 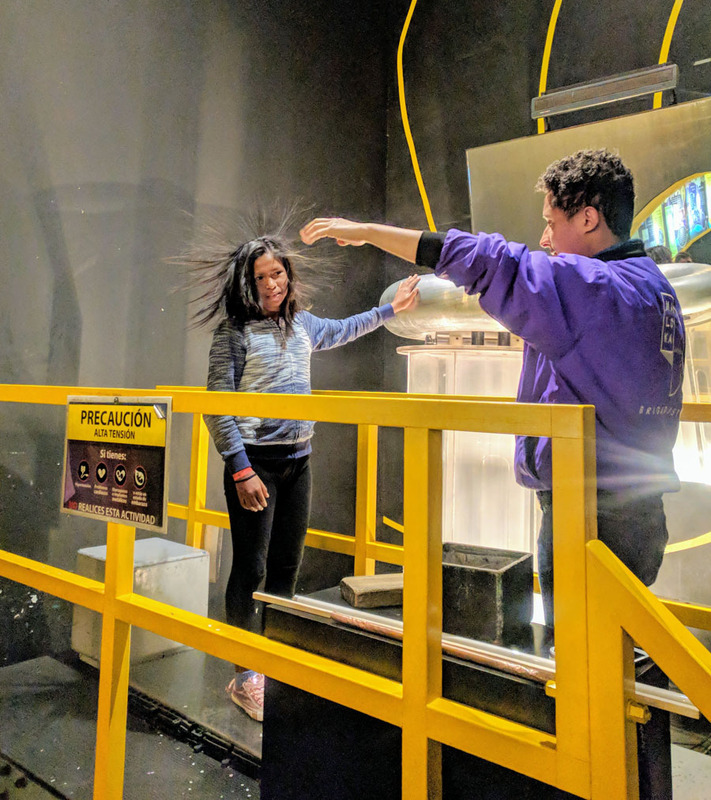 In the above picture, Stefanie volunteered to be hooked up to a generator which produced massive amounts of static electricity. Her hair can be seen rising up due to the differences in electric charge. We also experienced a lightning arc when we were inside an insulated cage. After seeing the exhibits we got a snack in the cafeteria and then went to see a movie. The movie was the new Spiderman animation in 3-D. They had no idea that a movie could be seen in 3-D! Resting outside of the museum. 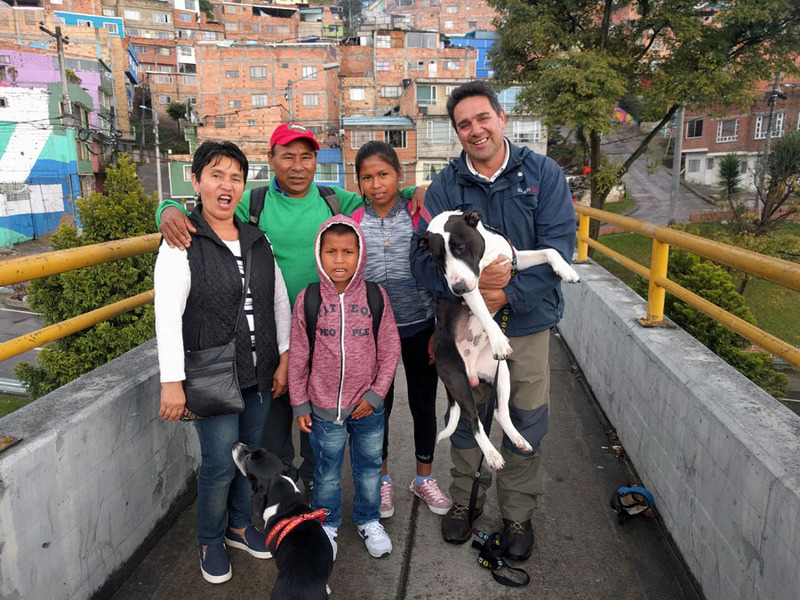 Later that afternoon we met with Andres and his dogs. 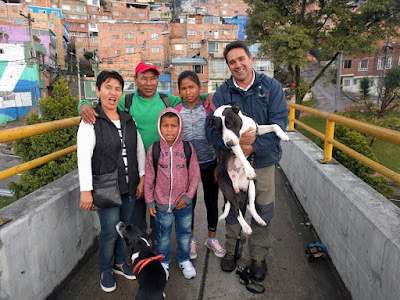 He is our friend from Bogota. Gustavo and the kids stayed at Andres and Patricia's house on Sunday night. When there they got to see the famous sights that were downtown. The church Monserrate, which overlooks the city of Bogota. On Monday morning we all met downtown. Then we went up to one of the mountains overlooking the city. 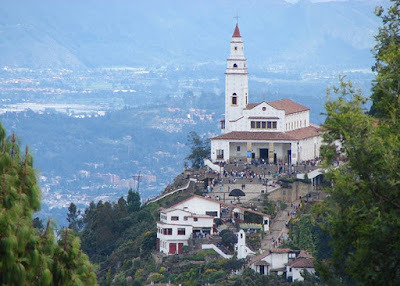 On the mountain is the famous church of Monserrate. Thousands of people visit this shrine daily. Tens of thousands visit it during holy days. We had to get there on the teleferico, a gondola car. At the steps in front of the church. After visiting Montserrat we returned to Suba. The next day we celebrated Stefanie and my birthdays, both of which are on January 8. We had carne asada (thin grilled steak), rice, plantain, salad, and birthday cake. In my apartment in Suba. We celebrated Stefanie and my birthdays. 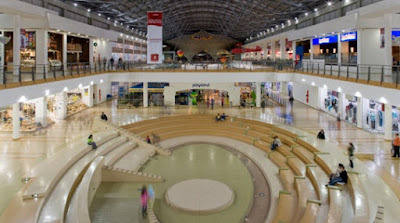 After the birthday lunch, we went to the mall Plaza Imperial to see a movie. Is was nice to walk through the city and through the mall. Most of the city was still on vacation, so the place was packed. The outside of Plaza Imperial at night. 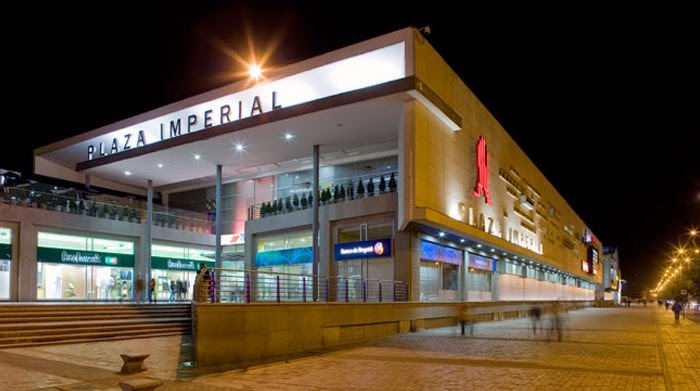 Plaza imperial is the largest "Centro Comercial" in Suba. This picture was from years ago. Went we went, this open area was almost standing room only. 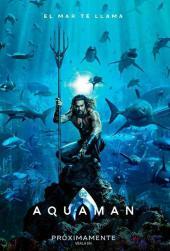 The movie we picked was Aquaman. It had a lot of action. After the movie, Gustavo asked if there really were people who lived under the sea that fought wars. I told him yes, but not quite like what was shown in the movie! We all thought the movie was great! At last, on Wednesday morning they returned to the Amazon. 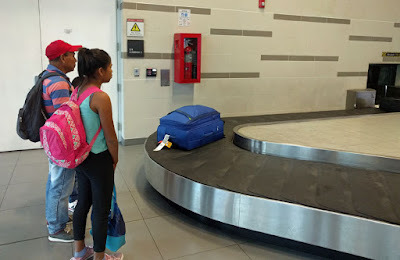 I dropped them off at the airport and waited until they passed through security. I called the next day to check that the had arrived safely in the village. When they return to the village we hope that the kids share their experiences. We hope they will avoid the poverty trap which many have fallen into and strive to develop sustainable business in the community. 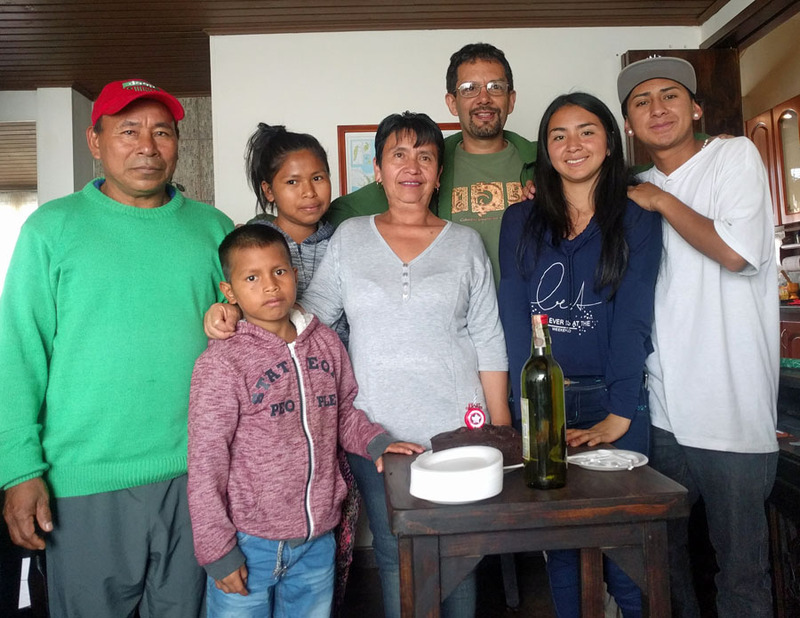 They and the other students that we sponsor are the future of the village of La Libertad. Part of the Amazon Pueblo project. Sustainability through the education of indigenous youth of the Amazon. 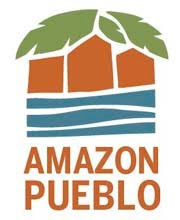 Amazon Pueblo 2018. Registered nonprofit EIN: 46-0893738, 13 Sunset Street, Thomaston, ME, 04861.. Powered by Blogger.